So I have mentioned that the communities that our girls live in are very far from towns with schools. That is why we have a dormitory for them to stay in during the week – so that they can actually reach a high school. What better way to understand our population, than to actually visit them there, and make the trek myself? 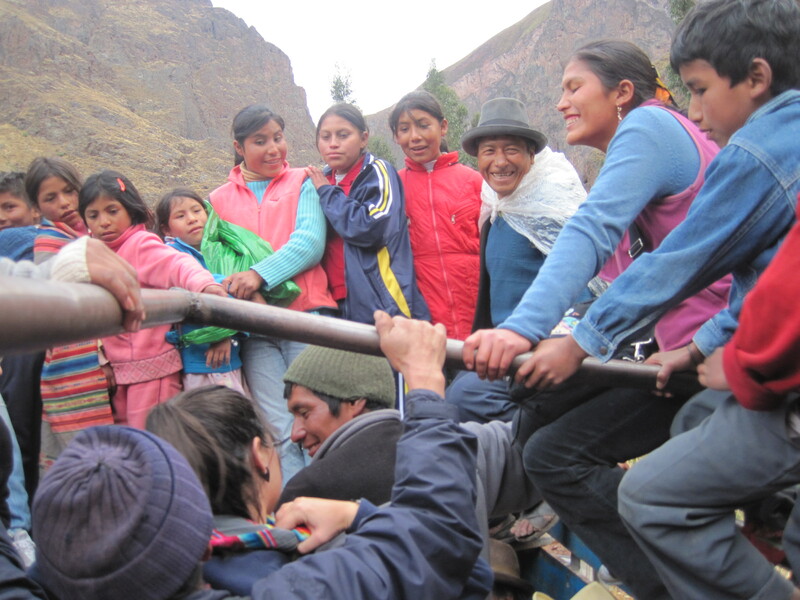 Great idea – I can thank Alex (our founder, and inspiration behind the Sacred Valley Project) for taking us for a “hike” into the mountains one weekend to meet with several of our families. It was an experience that changed my perspective on who are girls are, how they live, and what we are doing here. How difficult could it be to get to school? I mean, really? I have listened to my in-laws’ stories of how hard it was for them to get to school – walking to school 5 miles, uphill both ways, in the snow…. which made my own high school journey seem like a piece of cake: walk 2 blocks to the bus stop – take the B58 bus for about 15 or 20 minutes, then take the “EE” or “GG” subway line to Continental Ave. where I switched to the “E” or “F” subway to the end of the line. 45 minutes total. Not bad. My kids, growing up in the suburbs, think that my trip was kind of insane. Let’s face it, they’re spoiled. 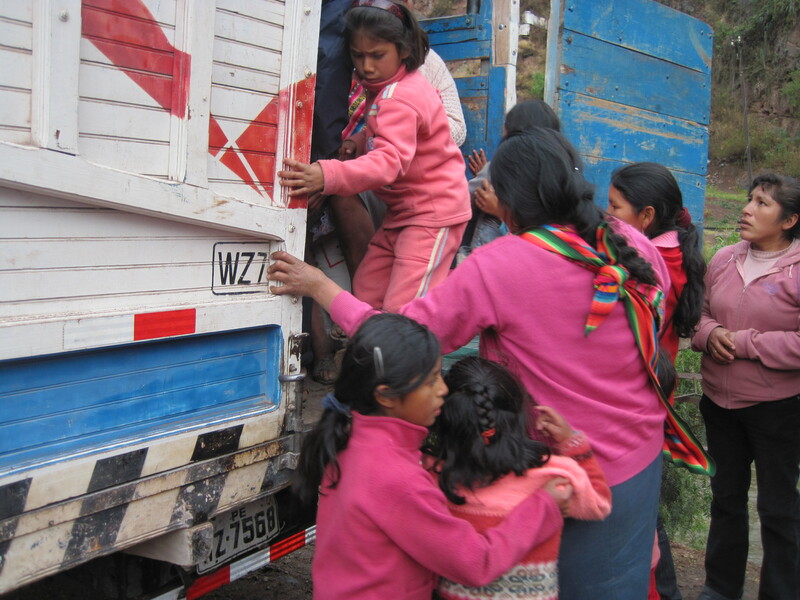 But neither they nor I could ever have imagined how difficult getting to school could be. Let’s face it. I’m spoiled. We started out for the first village of Socma. 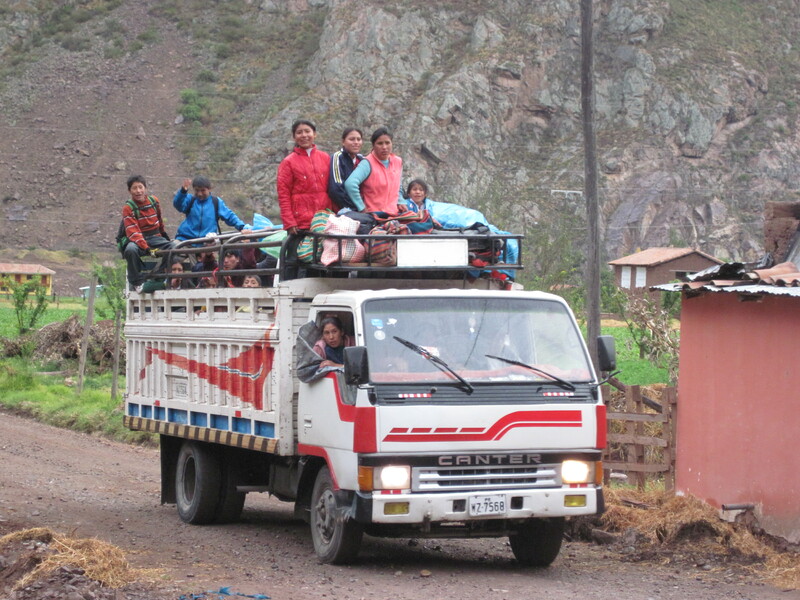 Socma is probably the easiest village to get to – as twice a week, there is transportation that goes there. Luckily, one of those days is Friday afternoon, so the girls from that community can get transportation home for the weekend. Unfortunately, it is not available on Sunday evenings, when the girls return to the dorm – so they have to walk the entire way. Two of our girls live in this community. To start with, we walked to the mercado (market), where we took a combi. A combi is a Toyota passenger van, that in the U.S. would normally hold 8 to 11 passengers. These vans have been re-fitted however, and it is most common to have about 25 passengers crammed in like sardines – some in seats, some standing over the people in seats. Oh, and of course, you have all of your “stuff” on top. 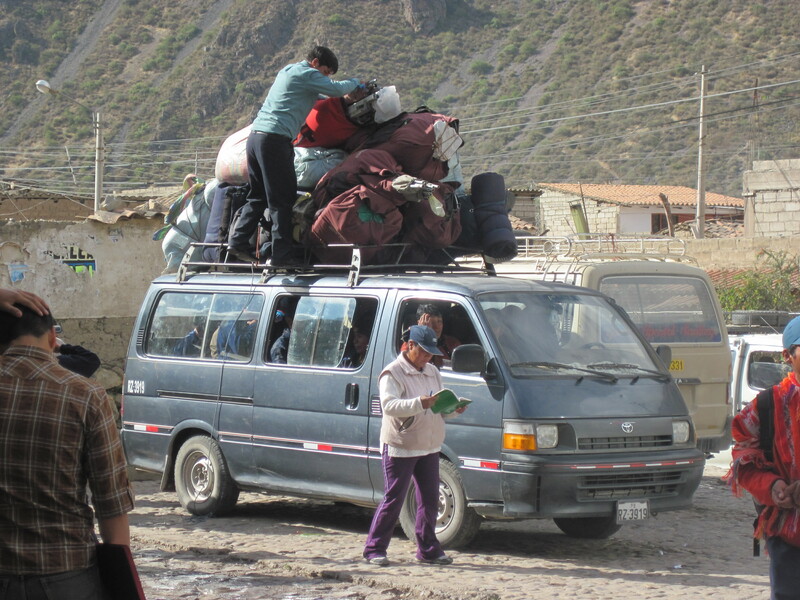 I am used to taking a combi to our next town, Urubamba, as that is where I take language classes once in awhile. Once you are stuffed inside, you try to hold your breath if you are not lucky to be sitting next to a precious window, because let’s face it – it’s pretty ripe in there! What else can you fit in here? A 15 minute combi ride to Pachar, where we sat, kind of in the middle of nowhere…. waiting. I wasn’t sure for what, but I have learned that in Perú, don’t ask questions – as you probably won’t understand the answer anyway, and you will just become more frustrated. Watch and observe – that’s the name of the game. It soon became apparent that our next mode of transport was a truck. Really? This is it? Where were we going to fit – it was brimming to the seems already. The truck experience was something I could not have imagined at all. It was a far cry from my Toyota Highlander with it’s plush leather seats, adjustable lumbar, coffee cup holder and sunroof that I practically live in, and have used to shuttle my kids back and forth to school . Well, I guess the truck did have a sunroof of sorts….but there were definitely no coffee cup holders. We climbed into the truck, along with 80 other people. Yes, 80 – during the 45 minute ride I counted them. Most were women and children and babies. For most of the ride, I stood on one foot – as there was absolutely no place to put my second foot. I was standing on top of a 50 lb. sack of rice. Crammed in like sardines, my body was juxtaposed so that my foot was at least 4 feet in front of where my head was. I was holding on to a little girl who must have been about 5 or 6 years old named Marylin. Actually, I had my arm around her waist, and was holding her up so that she would not be completely crushed by the crowd of people as we made our way up into the mountains on a rocky, hairpin turn road. Old women on their way home from market were crowded next to nursing mothers, next to children trying to catch a ride home from school, all on top of huge sacks of supplies from town. The amazing thing to me was that everyone was in a great mood. “Why?” you may ask. Not only do they not have cushy seats, but they can’t even rest their Starbucks comfortably in this vehicle. Well, the answer should be pretty obvious by now – they actually had caught the truck, which meant they would not have to hike about 2 hours up into the mountains. Sweet. The ride lasted about 45 minutes, and we jostled against each other the entire way, holding each other up, trying not to fall underneath the huge pile of human mass. 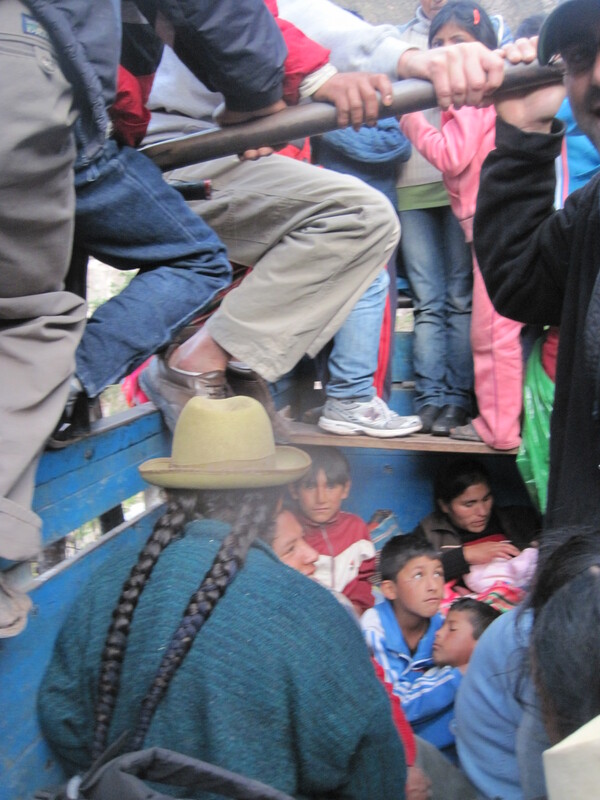 When we finally arrived in Socma, I felt much closer to my new Peruvian amigos…. their joy had rubbed off on me, and my eyes were beginning to open. Be grateful for what you have. Take joy in each thing that comes your way – look for the good in everything. We are truly fortunate. Speaking of being fortunate, every day I am grateful for all that I have – and today I am grateful that you are even reading this, and learning about us! This entry was posted on Friday, November 11th, 2011 at 2:21 pm	and posted in Mission: PERU. You can follow any responses to this entry through the RSS 2.0 feed.